Paint and Sip is an instructional painting lesson usually consists of groups and accompanied by wine or other beverages. This event has increased rapidly since 2007. Furthermore, Iris started Paint and Sip in Yangon in July 2017 as a way to raise funds to run a primary school in an isolated village in Mon State. Her event lives on in the Philippines to fund art scholarships and to encourage people to explore their artistic capacities with the help of wine and friends. Talented and accomplished artists have been invited to share their expertise and journey to make the event more effective and incredible for participants! Jessica will be the main artist of the operation. She has worked in he has worked in AIESEC for 6 years as well, then served as a Partnership Manager for Asian Development Bank, and is currently a consultant for NGOs in the Philippines. She is a licensed Zumba instructor and certified Spanish teacher, but her true passion is painting. She started at the tender age of 6 and is happy to finally have found a relevant cause for her talent. Iris is not an artist but an art enthusiast, with 6 years of development work experience in AIESEC, an international NGO. Through that, she became a Country Manager and Global Expansions Coach in Myanmar. The proceeds from this event will be used to fund an organization to honor Sir Chinggoy Alonso’s contribution to Philippine arts and theatre. Chinggoy was a Filipino actor in theatre, movies, and television. He appeared in countless movies during his lifetime. Sadly, last October 2017, he passed away due to cancer. Eco Hotel Philippines is a company that is passionate about conservation, preservation, and protection of our environment. As a green service hotel, Eco Hotels ensures that Eco-friendly processes are implemented from construction to day-to-day operations. This is aligned with its advocacy of minimizing its impact on the environment while imparting practices of sustainability to their staff and guests. This art workshop aims to impart valuable tips to unleashing your love for arts like Iris and Jessica. Don’t miss the chance to attend this greatly anticipated event. Mark your calendars now: 21st of April 2018, at Containers by Eco Hotel, located along SVD Road, Brgy. San Jose, Tagaytay City, 4:30 pm onwards. 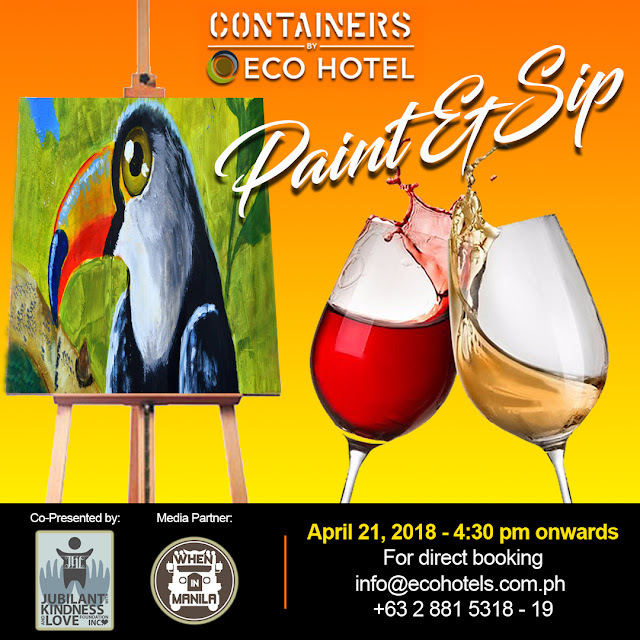 For more information, you may sign-up here https://goo.gl/forms/FTJDyumsJj7oSK5p2, email info@ecohotel.com.ph or message us on Facebook (@ecohotelph). #FoodPH - Jollibee Is Now In Toronto Canada! #TheaterPH - Mamma Mia! Is Coming To Manila!